Our experience was very much different than the Galkayo most Somalis poke fun of and even the Galkayo I grew up. I lived in the city during my first year of high school and my memories of the city were: too many mosquito bites, hot weather, tough folks and salty and bitter water. This week, we traveled to a sophisticated city with refined citizens and nuanced environment. I was thinking, ‘you have come a long way’! Galkayo University whose team was very professional and courteous hosted our team. We were staying at a fine hotel named Five Star Hotel, (only Reer Galkayo have the audacity to refer to a hotel by that name!) The service, courtesy of staff and amenities of the hotel were indeed excellent and the price was fair. From logistics and attendance to participation and dialogue, the whole process was flawless and exceeded our expectations. 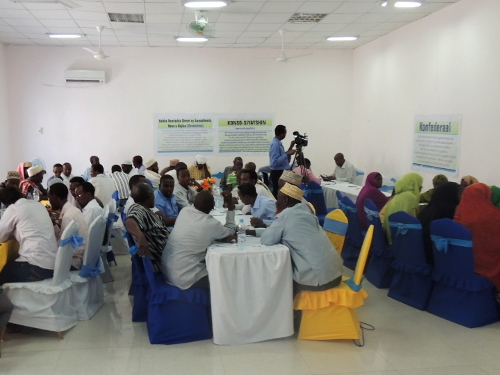 All segments of Galmudug side of Galkayo citizens – from youth, women’s groups and religious leaders to elders, intellectuals and businesspeople participated in the debate. 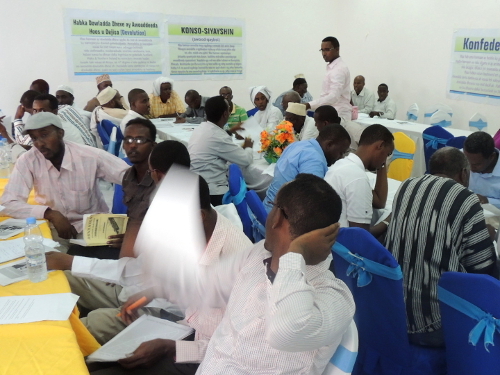 As expected, the discussion was candid and consisted of a presentation of a previous study by HIPS titled Decentralization Options for Somalia, followed by question and answer session, a focus group discussion and survey questions. Galmudug government led by acting president and Speaker of Parliament Hassan Mohamud Hayl opened the discussion by welcoming the HIPS team. Despite his seniority in terms of age and rank, Mr. Hayl was humble enough to share with the audience that the young HIPS director Abdi Aynte was once his English teacher. The entire hall responded with round of applause. 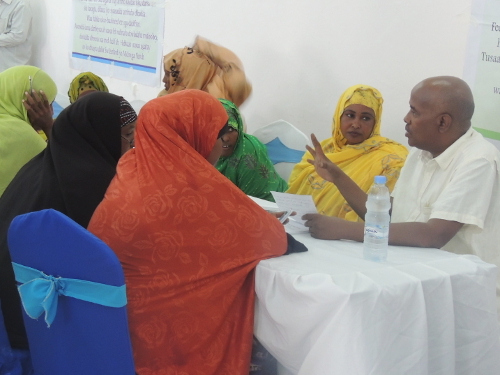 Some assume humility (as shown by the Speaker) and appreciating modesty (as illustrated by the audience) are alien attributes of the people of Galkayo, however it is evident that the people of Galkayo do not shy away giving credit where it’s due. The three-hour discussion that followed was lively and exciting. All participants contributed passionately. 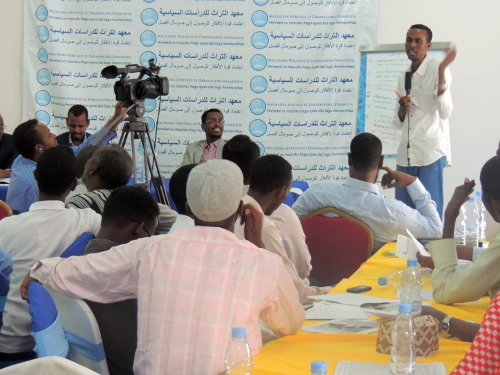 Views were as diverse as the background and profession of the attendees and civility was in full force, notwithstanding Galkayo’s reputation of brazenness. 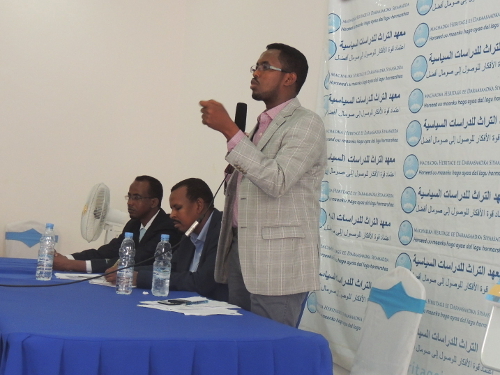 We sparked much needed discourse on federalism, and we believe that the people of Galkayo (Galmudug) are far more informed now than ever. 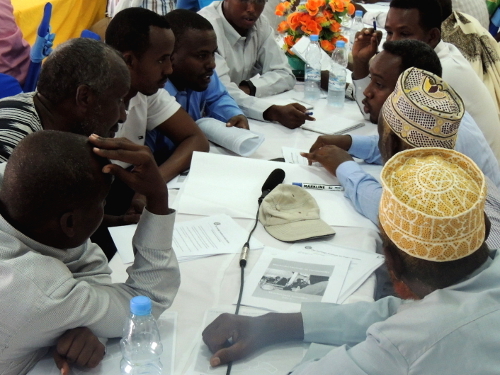 Suffice to say, though I rarely brag about my Reer Galkayo roots, the candor or beyzaaninimo exhibited by the Galkacyo citizens during our Dialogue on Federalism visit rekindled my respect for the city. This entry was posted in Comment, Uncategorized and tagged Abdi Aynte, Abdirashid Hashi, Federalism, Galkayo, Galmudug, Heritage Institute, Heritage Institute for Policy Studies, HIPS, Mogadishu, Somalia. Bookmark the permalink. Trackbacks are closed, but you can post a comment. 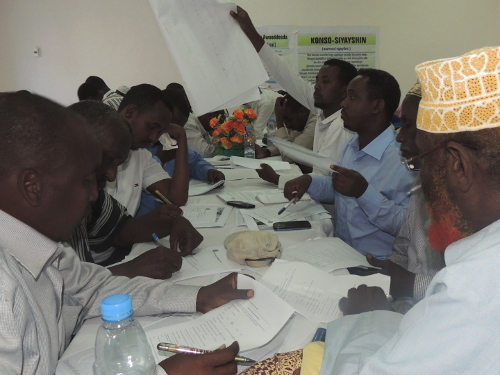 This is inspiring, to see Somalis extensively talk of the federalism structure in Somalia. Despite the negative branding of being a war torn nation. we still have such instrumental options and analysts on the means and ways that we need to operate under the federal system. Bravo HIPs!!!!! I enjoyed reading your article. I laughed hard as I read it too! I was away when you and the rest of the HIPS team arrived here but I heard your meeting was a very productive one. Praying for a more peaceful Somalia with respect for diversity!